Tropical Welcome brings you the best values on tours and activities for your holiday in the Caribbean. We have information on Caribbean scuba diving, Caribbean fishing, Caribbean golf, Caribbean sailing and Caribbean boat charters. Also, if you'd prefer not to get too wet, you can find land activities on our Trips & Treks page. For those who want to relax on the beach and recharge their souls, the Caribbean is a great place to be. For online reservations of Caribbean activities, visit the Caribbean Fun links to the left. The Caribbean offers everything from frog hopping to Camel rides. If you need to rent a car on your next Caribbean holiday, please check out our CarTrawler booking engine. We think you'll find the rates surprisingly good. Caribbean Golf - If you're coming to the Caribbean, bring your clubs with you. The warm weather and soft breezes seem to have been designed for this sport. On our Caribbean golf page we have gathered as many golf links as we can but if you find one we have missed, please let us know so we can add it. Diving in the Caribbean - Few places in the world offer divers the diversity of the Caribbean. Warm water, sunshine and coral reefs abound. If you are an accomplished diver or if you want to get your feet wet for the first time, come to the Caribbean. Please visit our diving page for links and information on all the islands. Fishing in the Caribbean - Like every other activity in the Caribbean, fishing is world class. From fly fishing to fishing for trophy sport fish, you will find an angler's paradise in these tropical waters. Sailing the Caribbean - Perhaps there is no climate better for sailing than the Caribbean. Each island, however, offers its own flavor of culture, music and cuisine. On our sailing page we have links to sailing adventures ranging from romantic moonlight sails to chartered holidays. Yacht Charters in the Caribbean - Ever dream of sailing away to a deserted island? This dream can be a reality when you charter a yacht. Caribbean Fishing Charters - If you and your mates are rigged for fishing, the Caribbean is the place for you. From day charters to week-long trolling, you can find your fisherman's paradise here. Caribbean Sailing Charters - Whether it's captained or bare-boat sailing that puts wind at your back, the Caribbean offers the best range of chartered sailing vessels in the world. Caribbean Watersports - There is something for everyone in the Caribbean. 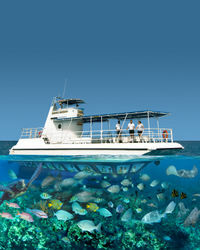 Snorkeling, underwater diving, kayaking, parasailing, and much, much more await the visitor there. 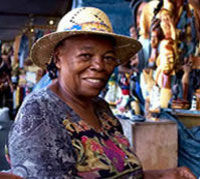 The Caribbean is as varied and rich with culture as anywhere in the world. Here you will find the tastiest cuisine, the finest hotels, the clearest water and some of the kindest people you will ever meet. When they were discovered by the first Europeans, the islands of the Caribbean were inhabited by two distinct tribes of indigenous people, the Arawak (sometimes called Taino) and the Caribs. The Caribs' unusual eating habits were quickly discouraged by the Europeans (they were said to be cannibals but this is in dispute) and so was the continuation of their tribe. Only a few Caribs survived by hiding in Dominica. Many of the Arawak were also killed or fled to remote islands, but some European conquerors, like the Dutch, welcomed them into the mix. For years it was taught in schools that all the Taino people of Puerto Rico committed racial suicide by jumping off the cliffs but now it is believed many of them only migrated to the outer islands to escape slavery. Unfortunately, this resulted in the loss of what has been discovered to be a remarkable culture. Recent findings in Caguana, Puerto Rico, (see video below) have uncovered an enormous complex of Taino artifacts and ceremonial fields believed to be a regional meeting place for Tainos from all parts of the Caribbean. We recommend visiting Caguana and seeing this ancient Taino site for yourself. Hop into a jeep and visit Arikoko Park and one of Aruba's hidden treasures, the "Seroe Colorado" Natural Bridge. But that's not all you see. Bring along a swimsuit, because after kicking up dust throughout Aruba's outback, you'll be cooling off in the tranquil waters of Baby beach, known for its smooth sands and spectacular snorkeling. Swim, sunbathe or just mellow out - the choice is yours in this tour, which explores Aruba's diverse charms both on land and at the shore. Snorkeling equipment is included. Get to know the biggest birds on earth! Join this educational and interactive tour that gives you the unique opportunity to feed these birds with your bare hands. The it's on to the Hato Caves, where you'll explore the unique formations formed thousands of years ago. 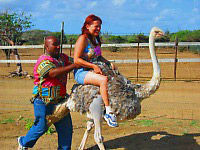 Learn about the wildlife and history of Curacao on this one of a kind family friendly adventure. Learn about the ostrich development from egg to adult bird and discover all about this wonderful reptile-like creature. Once at the farm, you'll board a safari Jeep with an expert guide who will narrate facts about the ostrich. You'll learn the difference between the black and gray colored animals, the reddish flame on their beaks, how fast they can run and how far they can see. You may even get the chance to ride one. Add some pure adrenaline to your Dominican vacation when you book the Wacky Roller Adventure Park. Travel from tree to tree in your harness via the suspended platforms in the Dominican rainforest. Take the challenge and be rewarded with a refreshing drink served at the riverside bar. Only in Dominica will you experience something as fun and action packed as this. 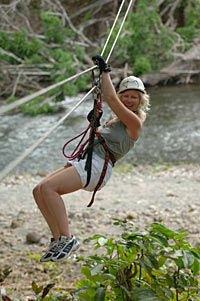 The Wacky Rollers Adventure Park is a survivor-like challenger course set in the natural rainforest in Dominica. Clad with your safety gear, including your helmet, harness and gloves, and after a quick safety briefing, your demonstration will begin. Listen carefully as the professional guides show you how to use the equipment. Travel on the trail, advancing from tree to tree via suspended platforms. You will encounter varied formations - the Indiana Bridge, Monkey Bridge, the Duck Walk and other footbridges and zip lines. There is even a Tarzan jump for the daring and the course ends with a zip across the Layou River and back. 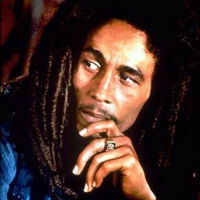 When one thinks of Jamaica (mon), you can't help but think of the King of Reggae, Bob Marley. Journey to the village of Nine Mile, where Bob lived, loved and played. Learn about the Rastafarian religion he practiced and made famous as well as seeing his final resting place. A moving tribute to a great musician. Travel through the hills and curves of the parish of St. Ann, called the garden parish, until you reach Nine Mile. This little village is tucked away in the beautiful mountains of Jamaica and is the birth place of the legendary "King of Reggae", Bob Marley. Buccoo Reef has been named one of the spectacular sights to behold in the world, so what better reason to visit? This 2 1/2 hour journey from Scarborough will take you to this natural wonder, where even non-swimmers will delight in the underwater world with a glass bottom boat ride. The island of tranquil Tobago, whose famous "Buccoo Reef" was visited by Jacques Cousteau, has many breathtaking views for photographic opportunities. Cousteau rated Tobago's Buccoo Reef as the number three spectacular sight to behold in the world. Your tour begins from Scarborough with a drive along the Claude Noel Highway before entering "Buccoo Bay Beach Resort" where you will board a glass bottom boats, to the Coral Gardens and Buccoo Reef.